The new panel mounted PA80 Peracetic Analyzer from Electro-Chemical Devices (ECD) simplifies process monitoring to ensure disinfection without the need for potentially harmful disinfection byproducts (DPBs). 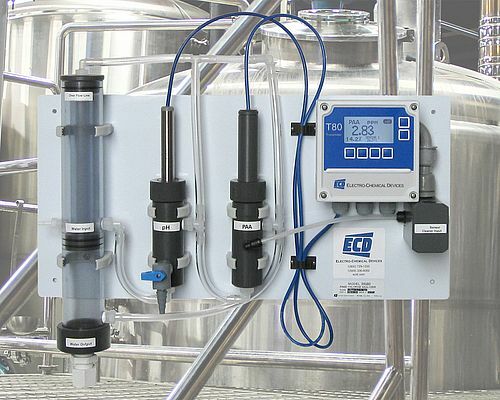 The plumb-and-play design of ECD's economical PA80 Peracetic Acid Analyzer allows a single technician to install the unit right out of the box with no special tools or complex calibration routines. Ready to go from the factory, the PA80's cost-effective design includes built-in flow control, and so there's no need to purchase or install pressure regulators and rotameters, which are typically an extra cost with many other types of liquid analyzers.